IEEE1588 nodes (e.g. PCs equipped with the syn1588® PCIe NIC) synchronize their local hardware clock with an accuracy of 10 ns or better to the absolute time information distributed by an IEEE1588 grandmaster over a complex network using the syn1588® Gbit Switch as a transparent clock (TC). This dramatically increases the clock synchronisation performance. 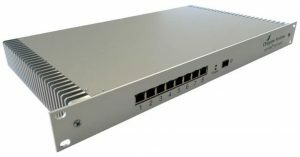 The syn1588® Gbit Switch is a standard 8-port 10/100/1000 Mbit/s Ethernet switch enhanced by an IEEE1588-2008 End-To-End Transparent Clock function. The unit is equiped with ruggedised RJ45 connectors suited for industrial applications. The syn1588® Gbit Switch is available in a standard 19″ rack mount case (1 HE). 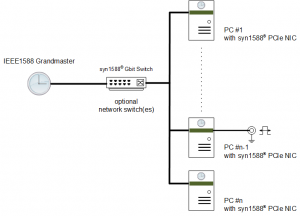 The syn1588® Gbit Switch offers an amazing timestamping accuracy of 2 ns. The purely hardware based IEEE1588 packet processing engine operates non-intrusively supporting up to 256 messages/sec PTP event message rates simultaneously on all ports. Optionally, high quality local oscillators will increase the accuracy even further in case of heavily loaded networks with residence times in the millisecond range.